The Ambassador of Estonia to India, H.E. Mr. Riho Kruuv hosted a Cocktail & Dinner reception on Friday, 8th March, 2019 at his residence. The Ambassador Mr. Riho Kruuv welcomed the guests and spoke about bringing new Indian business start-ups to Estonia and the evolving Innovation scene in Estonia. He spoke about the ease of starting a company in Estonia through digitalization and said 315 companies have been established by Indian residents in Estonia. He commented on the liberal tax regime in Estonia. Mr. Raman Sidhu, Chairman EBG Federation spoke about SMEs and their importance in Europe and who as yet do not get the attention they deserve in India unlike bigger companies. He said that EBG is now also focusing on SMEs including business matchmaking with Indian companies. The guest speaker Mr. Vinod Sharma, Political Editor at Hindustan Times also gave his insights and perspectives on the future in India. All in all, it was an enjoyable evening for which EBG is grateful to Ambassador Kruuv. An Interactive session on European Companies Business Opportunities and Challenges in India was organised with H.E. Mrs. Elzbieta Bienkowska, Commissioner- Internal Market, Industry, Entrepreneurship and SMEs – European Commission by EBG Federation, Bangalore at The Taj West End. This was attended by the EBG Federation members and H.E. Mrs. Elzbieta Bienkowska, Commissioner- Internal Market, Industry, Entrepreneurship and SMEs – European Commission and her delegation; Ms. Marika Jakkas, Head of Trade & Economic Affairs at EU Delegation to India; Mr. Raman Sidhu, Chairman, EBG Federation (EBG); Mr. Sanjeev Varma, Chairperson Bangalore Chapter moderated the discussion. The objective of the interactive session was to discuss with the European commissioner’s delegation, the issues that are being faced by European companies doing business in India. Business cooperation in the Space sector and further strengthen industrial cooperation between Indian and European companies. Formal inaugural session for the launch of the “Business Support to EU- India Policy Dialogues” project was held in the presence of H.E. Mrs. Elzbieta Bienkowska, Commissioner- Internal Market, Industry, Entrepreneurship and SMEs- European Commission on the 26th Feb 2019, at the Taj Mahal Hotel, 1 Mansingh Road, New Delhi, India. (timings followed by lunch) Drawing its inspiration from the conclusions reached at the 2017 EU-India Summit, The ‘Business Support to the EU- India Policy Dialogues’ Project aims to spur enhances bilateral business cooperation on the above mentioned policy dialogues by strengthening and supporting the businesses. The programme aims precisely at tapping into such business opportunities and focuses in particular, but not exclusively, to areas such as environment, energy, climate, mobility, urbanization, and ICT where there is already advanced cooperation- in the form of policy dialogue with India. The focus will bring together European and Indian SMEs through joint actions business to business matchmaking and exchanges on best practices. The program will carry out technical market studies, constitute a database of EU companies that can offer technical solutions and create an online platform to share information on the business opportunities and connect Indian and EU Business. The program started with a welcome Address by H.E Mr. Tomasz Kozlowski, Ambassador of the European Union to India. Followed by a speech on industry perspective on SME Collaboration by Mr. Anil Bhardwaj, Secretary General, Federation of Indian Micro and Small & Medium Enterprises (FISME). Thereafter a Key Note Address on the insights on enhancing EU-India Policy dialogues was given by Mr. Amitabh Kant, CEO, Niti Aayog. The chief guest of honor and speaker for the event was H.E. Mrs. Elzbieta Bienkowska, Commissioner- Internal Market, Industry, Entrepreneurship and SMEs – European Commission this was followed by an introduction of “ Business Support to EU – India Policy Dialogues” Project by Mr. Poul V. Jensen, Project Team Leader and then the concluding remarks were delivered by Mr. Raman Sidhu, Chairman, EBG Federation (EBG). An Interactive lunch event with H.E. Mrs. Elzbieta Bienkowska, Commissioner- Internal Market, Industry, Entrepreneurship, and SMEs – European Commission was organized by EBG Federation along with the European Embassy New Delhi at Jamavar, Leela Kempinski, Chanakyapuri, New Delhi. This was attended by the chairpersons of 8 committee chairs and H.E. Mrs. Elzbieta Bienkowska, Commissioner- Internal Market, Industry, Entrepreneurship and SMEs – European Commission, H.E Mr. Tomasz Kozlowski, Ambassador of the European Union to India; Members of Mrs. Elzbieta Bienkowska’s delegation; Mr. Christophe De Vroey, First Counsellor, Trade and Economic Affairs Delegation of the European Union to India; Ms. Marika Jakkas, Head of Trade & Economic Affairs at EU Delegation to India; Mr. Raman Sidhu, Chairman, EBG Federation (EBG); Ms. Rekha Khanna, Chairperson Delhi Chapter, EBG Federation (EBG) and Ms. Niharika Chopra. The objective of the interactive session was to discuss with the European commissioner’s delegation, the issues that are being faced by European investors doing business in India. Sector committees that participated included Alcoholic Beverages, Defence, Energy- Oil, Gas & Power, Healthcare, Logistics, Retail, and Telecommunication. Informal interactive session with Dr. V S Hegde fmr. CMD Antrix Corporation Ltd. Coincided with the visit of Honorable H.E Andrus Ansip ,Vice President of European Commission and Commissioner for Digital Single Market along with Senior officials Mr. Juhan Lepassaar, Head of Cabinet, Ms. Kamila Kloc, Deputy Head of Cabinet and Mr. Lars-Erik Forsberg, Deputy Head of Unit, Policy Outreach and International to Delhi, EBG Telecom sector committee had organized a luncheon interactive session on 26 October 2018 at the JW Marriott, Aero city, New Delhi. The CEOs and CXOs from the industry and Senior diplomats from EU Delegation and Ambassador himself H E Tomasz Kozlowski had attended this interactive business session. Mr. Sandeep Bhargava, Executive Vice President-Corporate Affairs & Public Policy, Vodafone Idea Ltd and Chair of EBG Telecom Sector Committee led the session. It was a well-attended and excellent session where Shri Piyush Goyal spoke on “Importance of FDI in the growth of the Indian economy and the role of European Business in India” organised at Taj Mahal Hotel, New Delhi. He mentioned that there is a lot of synergy that still needs to be tapped on both sides. He also spoke about the India - EU FTA and said that the best possible way to take it forward is to have reciprocity from both EU & India. Before his address, H.E Mr Tomasz Kozlowski, Ambassador of the European Union to India gave the opening remarks. This was followed by a brief intervention by Mr P Balaji, Chief Regulatory and Corporate Affairs Officer, Vodafone Idea Limited, Mr Martin Navratil, President, Home Credit India Strategy Advisory Pvt Ltd & Mr Julian Bevis, Senior Director, Group Relations, South Asia AP Moller-Maersk who shared their perspectives of doing business in India covering Telecom, Financial Services and Shipping sectors respectively. Mr Sandeep Bhargava, EVP, Vodafone Idea Limited brilliantly moderated the evening. Vodafone Idea Limited, Home Credit and Maersk supported this event. A meeting was organised by Mr Damian Kaminski, First Secretary ,Trade and Economic Affairs Manager , EU Delegation with Ms Ewa Synowiec, Director, Directorate General for Trade for EBG's CSR Committee Members. Ms Synowiec is responsible for Sustainable Development Economic Partnership Agreements, Africa-Caribbean and Pacific and Agri-food Trade. This lunch was an excellent opportunity to exchange with Ms Synowiec about the new CSR Committee set up on 5 September 2018 as well as CSR actions that they have been pursuing. Interactive session on impact of NFRA to Industry/CFO & Key Audit Matters Reporting effective FY 2018-19. EBG Federation Bangalore Chapter along with Kotak Mahindra Bank organized “ Interactive session on impact of Constitution of National Financial Reporting Authority (NFRA) to industry / CFO & Key Audit Matters Reporting Effective FY 2018-19 “ renowned Chartered Accountant CA M P Vijay Kumar - CFO, Sify Technologies Ltd and Central Council Member of ICAI was anchor of the session. The session was highly interactive and candid, the discussion was on what it means to accounting profession like NFRA evolution, Government of India Press release, Misconceptions, NFRA international scenario, NFRA-ICAI impact, NFRA composition, NFRA – work in progress, Disciplinary Committee at ICAI, impact to Accounting profession, and Regulations. Standard on Auditing (SA) 701, Communicating Key Audit Matters in the Independent Auditor’s Report discussed with need for ISA 701, benefits and principles of ISA 701. Key Accounting Matters points where also discussed extensively. In this interactive session, European companies Ikea, Astro Mueller, Bavarian Indian Centre, Enerpace, Essilor India Private Ltd, MTR etc., participated and got the benefits. Participants had ample time to spend one on one discussion with Mr. Vijay Kumar to get some specific insights. The event got concluded by presentation of memento by Kotak Regional Manager Mr. Sathish, earlier Mr. Karthik Vice President and Area Manager – International Business of Kotak Mahindra Bank Welcomed the participants. EBG Mumbai Chapter in collaboration with the Navnit Group organised a Cocktail evening on Friday, 27th Jul 2018 at Keiba with drinks and appetizers. For those interested in a Test Drive - The Navnit Group invited them to test drive the Jaguar and Land Rover Range Venue: Keiba at the Royal Western India Turf Club, Mahalaxmi, Mumbai. It was an important day for EBG Federation as an MoU was signed with the PHD Chamber of Commerce and Industry to work together in the field of European and Indian SMEs. Mr Anil Khaitan, President , PHDCCI, Mr Saurabh Sanyal, Secretary General, PHDCCI along with his team were present. The MoU was signed by Mr Anil Khaitan and Mr Raman Sidhu. EBG Members got an excellent opportunity to network at Akira Back, JW Marriott, Aerocity, New Delhi at an event hosted by Mr Sandeep Gupta, Owner and Director of JW Marriott, Aerocity. Mr Sushil Gupta also joined the EBG Members to what was a lively evening. The members enjoyed the hospitality of Mr Sushil Gupta and Mr. Sandeep Gupta. A cultural evening organised by the Serendipity Arts Foundation - A Munjal (Hero Group) initiative for creativity. Meeting with Shri Atul Chaturvedi, Additional Secretary, Department of Industrial Policy and Promotion, Ministry of Commerce & Industry. The EBG Members across sectors met Shri Atul Chaturvedi, Additional Secretary, Department of Industrial Policy and Promotion, Ministry of Commerce & Industry. This was a follow up meeting for EBG's Sector Committee Members following the release of the 2018 edition of the EBG Position Paper. The following sector Members got an opportunity to highlight one or couple of key concerns that they wanted the Government to look into - Alcoholic Beverages, Automotive, Financial Services, Healthcare, Homeland Security, Manufacturing and Retail. Mr Raman Sidhu, Chairman, EBG Federation led the delegation. Shri Chaturvedi mentioned that DIPP will help to push for the clarifications sought by the Members with different Ministries. He asked the members to submit this list of clarifications to his office. Invest India,the National Investment Promotion and Facilitation Agency of India and which acts as the first point of reference for investors in India will work closely with EBG in this matter. (As you are aware, Invest India is set up as a non profit venture under the Department of Industrial Policy and Promotion, Ministry of Commerce and Industries, Government of India). As a follow up process, Shri Atul Chaturvedi has also agreed to meet the EBG Sector Committee Members across sectors once every quarter. EBG in association with Roseate Hotels & Resorts organized its 6th Leadership Series, where our guest speaker was Mr Manoj Kohli,Executive Chairman, SB Energy (Softbank Group). Topic of the session: “Global transformations of Energy and Transport Sectors and their impact on the Indian scenario”. Mr Sudhir Narang, Managing Director, British Telecom and EBG's National Council Member welcomed Mr. Manoj Kohli and he also thanked Mrs Radha Bhatia, Chairperson, Bird Group for hosting the EBG Members at the Roseate Hotel. It was a very interesting session where Mr Kohli took the Members through his experience of starting work with the manufacturing sector moving on to Telecom and now finally working in the Energy and Transport Sector. He said that energy is core to growth and the global transformation of energy from fossil and nuclear energy to renewable energy is happening.This transition will have to be done carefully and will take 20-30 years. He also shared the work being done by SB Energy, SoftBank Group in this sector. SoftBank has built the largest solar plant in Saudi Arabia and have plans to do a project in Africa. He mentioned that the Banking sector is also supporting the energy transformation by bringing down fossil funding to zero and moving up the renewable energy funding. He then shared his thoughts on the transformation in the transport sector and talked about the shift from diesel and CNG vehicles to electric vehicles. Mr Kohli answered some interesting questions from Members. Mr Kush Kapoor, Area General Manager, Roseate Hotels gave the vote of thanks. A good breakfast session was organised on Friday, 1st June for the Bengaluru Members. Key Highlights •	The session covered overview of EBG wherein the members were briefed about membership base of EBG, the events that EBG generally organizes, Position Paper etc. •	Mr. Merill Cherian, Director, KPMG, gave a short presentation on the GDPR policy which came into effect from 25th May. •	This was a very participative discussion and the attendees were keenly interested. Mr. Jose Jacob, Director, Organizing committee of TIA Summit in July gave a short presentation on their association with EBG for the Summit. EBG Position Paper 2018 was presented to Mr. Krishna Jadhav, the Secretary to the Minister of Industries and Mining, Government of Maharashtra and also a Deputy Collector who accepted on behalf of the Minister on Monday, 28th May 2018 at the Taj Mahal Palace, Mumbai. Unfortunately, Mr. Desai was unable to attend the event as he was held back in Palgadh due to the by-elections that took place on that day. The evening was well attended by various Company Heads, Consul Generals, Embassy and Government officials. Fuchs Lubricants was the main Event Sponsor. Motul and IDSA were the Gold Sponsors. The Delegation of the European Union to India in cooperation with EBG Federation organised a luncheon roundtable with Mr. Marco Buti, Director General at the Directorate General of Economic and Financial Affairs, European Commission and H.E. Mr. Tomasz Kozlowski, Ambassador of the European Union to India at the Taj Mahal Palace Hotel, Mumbai. The meeting focused on broader macro-economic issues and on the business environment for EU banks in India. The EBG Position Paper 2018 was released jointly by Dr Rajiv Kumar, Vice Chairman, NITI Aayog and H.E. Mr Tomasz Kozlowski, Ambassador of the European Union to India along with the present Ambassadors of the European Embassies in India and the EBG National Council and Regional Chapter Council Members. Meeting hosted by the Consul General of Switzerland, Mr. Martin Bienz for the members of the Swiss-Indian Chamber of Commerce (SICC) and EBG Mumbai Chapter. The Consul General of Switzerland, Mr. Martin Bienz hosted a business talk with Mr. Marcel Pawlicek, Global CEO, Burckhardt Compression Group, Switzerland for members of the Swiss-Indian Chamber of Commerce (SICC) and the EBG Mumbai Chapter Members. Mr. Pawlicek spoke about structuring a global company for operational flexibility and innovation and shared the history behind the success of the Burckhardt Compression Group. The representatives of the European Transport Sector met H.E Ms Violet Bulc to share their thoughts on the : India’s Modernisation agenda : Challenges and Issues faced by the European Transport Sector. Mr Raman Sidhu, Chairman, EBG Federation gave the welcome address. H.E Mr Tomasz Kozlowski, Ambassador of the European Union to India gave the opening remarks followed by the key note address by H.E Ms Violetat Bulc. It was a very interactive meeting and Madam Bulc was very happy to receive the inputs from the Industry representatives before meeting her counterparts in the Government of India. We will be sharing the speech of H.E Ms Violeta Bulc and the EU Ambassador shortly. This was followed by a very interactive panel discussion moderated by Mr K Srinivasan, Editor-in Chief, Newsline Publication. The panellists were Ajish Babu - CSO Head and Commercial Head for North and East India, Damco India – Maersk Group, Arvind Bhatia – Vice President, Doppelmayr India Private Limited – he shared his views on how ropeways can provide an effective means of transport in the urban context and its applications to make way for Smart Mobility in the Indian Context & Akhilesh Yadav – COO, Frauscher Sensor Technology – an expert in the Railway sector.Ms Payal Singh, National and Delhi Council Member gave the vote of thanks. Department of Revenue, Ministry of Finance convenes pre-budget meetings with trade and industry Associations every year to discuss suggestions/ recommendations in respect of tax issues pertaining to different sectors. 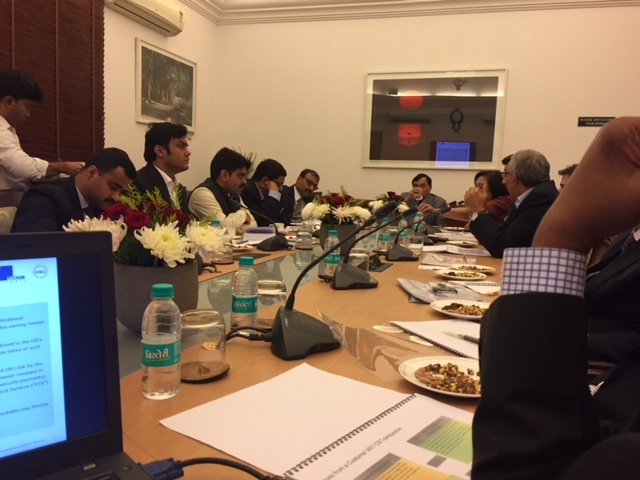 For the forthcoming Budget 2018-19, EBG & AmCham Members were invited to meet and present the Pre Budget recommendations to Shri Sushil Chandra, Chairman- CBDT, Department of Revenue, Ministry of Finance on Thursday, 7 December 2017. EBG presented the Direct Tax issues and AmCham presented the Indirect Tax issues. Pre Budget recommendations for changes in the duty structure, rates and broadening of tax base on Direct and Indirect tax have been submitted to the Department of Revenue. EBG thanks Deloitte for helping us with the Pre Budget recommendations and the meeting. Celebrating 20 years of EBG - Tuesday, 28th November 2017. H.E. Ms. Brigitte Öppinger-Walchshofer, Ambassador of Austria hosted the EBG Members at her residence on the occasion of completion of 20 years. Our patron the EU Ambassador, H.E Mr Tomasz Kozlowski also graced the occasion. It was a quiet and enjoyable evening for the Members. The 14th India-EU Summit took place in New Delhi on 6 October 2017. This was a very high profile Summit where EU leaders, H.E. Mr Donald Tusk, President of the Council of the European Union, H.E. Mr Jean-Claude Juncker, the President of the European Commission, and H.E. Ms Federica Mogherini, the High Representative of the European Union for Foreign Affairs and Security Policy and Vice President of the European Commission, met H.E. Prime Minister Narendra Modi. It was decided to hold a Business Forum immediately after the Summit, where H.E. Mr Jean-Claude Juncker delivered a key note speech on EU-India economic and business relations. EBG Federation successfully partnered with CII, FICCI and ASSOCHAM to organize this EU India Business Forum. EBG’s efforts to support the Business Forum has been appreciated by the Delegation of the European Union to India. EBG Federation would like to thank the Ambassador H.E Mr Tomasz Kozlowski and Ms Marika Jakas, Counsellor – Head of Trade and Economic Affairs, Delegation of the European Union to India for giving EBG an opportunity to play an active role in this important Business Forum. A session on 'Goods & Services Tax - Industry Specific Issues’ was conducted by Grant Thornton on Wednesday, 19th July, 2017 in Mumbai. The discussion focused on highlighting the key areas of concerns for industry regarding the GST law. It also shed light on a few pressing challenges with the new law. Mr. Suresh Nandlal Rohira – Partner, Grant Thornton India LLP conducted the session which was very informative and interactive. EBG Federation – Bengaluru Chapter released this year’s Position Paper on key policy reforms on several key areas of interest to European Business on Friday, 16th June, 2017 in Bengaluru. The Paper was released by Mr Raman Sidhu, Chairman, EBG Federation, India, Ms Anandi Iyer, Chairperson, EBG Federation, Bengaluru Chapter, Mr M.C. Dinesh, President-FKCCI, Dr JérômeBove, Scientific and academic attaché- French Embassy in India – Bengaluru, Mr Navin Paul, Executive Vice President- Bosch Limited and Mr Mahesh Jaising, Partner-BMR Advisors. The event was convened by EBG members, Industry leaders, Government officials and policy makers. While addressing the participants, Mr Raman Sidhu, Chairman, EBG Federation, India said this Position Paper has covered 18 key sectors to actively engage with key policy changes to enable business growth in each of those areas. He also said that EBG is working to promote, propagate and protect European Businesses in India. Speaking on the occasion Ms Anandi Iyer, Chairperson, EBG Federation, Bengaluru Chapter said that “EBG Federation is an active and vibrant community and has been supporting India – EU trade relations to ensure that the needs of the European business are well presented to policy makers and decision makers. She thanked all the EBG Council members, Sector Committee members and the EBG members for the great support. Mr Mahesh Jaising commented that EBG members should come forward with the challenges faced in their business. This will help us to recommend real-time challenges to the Government. The EBG Position Paper was presented to Shri Sumit Mullick, Chief Secretary, Government of Maharashtra on Thursday, 18th May, 2017 at an evening event organised at The TajMahal Palace, Mumbai. It was a well-attended event. The event was supported by Fuchs Lubricants, Motul and Hafele. Presentation of the EBG PP 2017 to Dr Bart De Groof, Consul General, Belgium in Chennai at an Wine and Cheese evening hosted by him at his residence. H.E. Mr Harald Sandberg, Ambassador of Sweden hosted a buffet reception for the EBG Members at his well-appointed residence in New Delhi on Wednesday, 10th May, 2017. Mr Anil Padmanabhan, Executive Editor, the Mint spoke and interacted with the Members. Ms Rekha Khanna, Chairperson, Delhi Chapter presented the 2017 edition of the EBG Position Paper to Ambassador Sandberg. Mr Kersi Hilloo, Vice Chairman, EBG India and Chairman, Mumbai Chapter also joined the event. The 2017 edition of the EBG Position Paper was released by H.E Mr Tomasz Kozlowski, Ambassador of the European Union to India; Shri Amitabh Kant, CEO, NitiAayog, Shri AnupWadhawan, Additional Secretary, Department of Commerce, Ministry of Commerce and Industry; Shri Arvind Gupta, All India BJP Head- Media & Technology & Spokesperson and the present EU Memberstate Ambassadors on 24th April, 2017 at the Lalit, New Delhi. The event was well attended with around 200 participants and had representation from CEOs, CFOs and Managing Directors of major European companies, leading consultants and Ambassadors and and senior officials from the European Embassies. It is noteworthy to mention about the efforts put in by all the Sector Committee Chairpersons & its members and all their knowledge partners for the timely publication of the EBG Position Paper, 2017 The event was sponsored by G4S, BMW, Tetrapak, Maersk Group, Home Credit, SAAB Group, BAE Systems, Oriflame, PernodRicard, TUV Rheinland, Outokumpu, Alar Infrastructures, Heka Support Services, Moet Hennessy &Kyndal Group. Dr.ArokiaswamyVelumani is an Indian scientist turned entrepreneur. He is the Founder, Chairman, and Managing Director of Thyrocare Technologies Ltd., a chain of diagnostic and preventive care laboratories headquartered in Navi Mumbai. Dr. A Velumani spoke to the EBG Members in Mumbai on 15th March, 2017 at an evening event organised at the Royal Bombay Yacht Club on his “Success story” from his humble beginnings and his success to great heights. A networking evening organised by the Nordic Ambassadors in Chennai 21/02/2017, Chennai EBG Chennai Chapter Members invited to attend a networking evening organised by the Nordic Ambassadors in Chennai on Tuesday, 21st February, 2017. EBG Members invited by the Delegation of the European Union to India to meet and interact with the one of the Delegations of the Members of the European Parliament visiting India on Monday,20th February,2017. EBG Bengaluru Chapter organized its Post Budget session on “Decoding Union Budget Analysis-2017 and GST Update” on 16th February, 2017 at Le Meridian Bangalore. The event was a great success, convening around 45 participants. The aim of the event was to get insights and discuss in detail the significant announcements made in the Budget with experts at BMR Advisors. BMR Advisors had given an overview on Corporate Tax & Transfer Pricing, Indirect Tax and an update on GST. EBG Mumbai Chapter also organized its “Post Budget Session Thursday, 2nd February, 2017 at the “Gateway Room”, TajMahal, Mumbai, Mumbai at 7 pm followed by Cocktail reception. The Mumbai session was conducted by Mr Vishal Agarwal Partner, BMR & Associates LLP and Mr Kaustav Sen, Partner, BMR & Associates LLP. The speakers shared their perspectives and gave a synopsis on the Budget 2017. The session was followed by an excellent interactive session. EBG Federation, Delhi Chapter invited its members to get expert insights and discuss in detail the significant announcements made in the budget, with experts at BMR Advisors, as the government presented its full-fledged budget on 1st February, 2017. The event was organized on Thursday, 2nd February, 2017 at Hotel The Royal Plaza, 19, Ashoka Road, New Delhi; the very next day of the announcement of the budget. The event started at 4:00pm with Hi-Tea. The speakers for the session were – Ms. Parul Jain, Partner, BMR & Associates LLP and Ms. Payal Tuli Partner, BMR & Associates LLP. Ms Tuli and Ms Jain did an analysis and review of the Union Budget 2017 covering the Direct Tax, GST and Indirect Taxes in their presentations. Welcoming the New Year can be an exciting time, filled with high anticipation, new resolutions and expectations for the months to come. Nothing brings people together like the new year party and that too a whole day long with friends, wine, music, dance and good food! EBG Mumbai Chapter organized its 'Welcome 2017 party' on Saturday 28th January, 2017 at CcazaCcomodore in Mandwa. The Members were invited for a day of fun, lunch, good cheer in the most breathtakingly beautiful venue at the “Ccaza Commodore” in Mandwa. Members travelled to Mandwa through the ferry services running between Gateway of India and Mandwa. The invitation was open to partners/spouses and children. On 23rd January 2017, EBG India organised a workshop on "Building roadmap for EBG India". The aim of the workshop was to encourage fruitful discussions between the EBG members in order build a way forward for EBG India for the years to come. The workshop was conducted in Hotel Royal Plaza, New Delhi and was sponsored by Veolia India. The Workshop was conducted by Mr Manod Jinnuri from Saab India. Mr Jinnuri focussed on the collective approach from the members. The ideas and responses collected during the workshop is being used to draw a roadmap for the future activities and status of EBG India as the prime advocacy group for the European Businesses in India. A similar workshop is being planned for the Mumbai Chapter as well. The EBG Federation India in collaboration with the Delegation of the European Union to India and Confederation of Indian Industry (CII), organised an interactive Session “The EU and India: Partners in Growth” with H.E. Mr JyrkiKatainen. Mr Katainen is the Vice President of the European Commission and was on a visit to India. Mr.Katainen is responsible for Jobs, Growth, Investment and Competitiveness. Before assuming the current position, Mr Katainen shouldered the responsibility of the Prime Minister of Finland from 2011 to 2012. The venue for the event was Inspire Hall, Hotel Le Meridian New Delhi. The event was very well received and attended by 70-80 Members. The event was followed by a networking lunch. The eminent panel included Dr Shashi Tharoor, Member of Parliament for Thiruvananthapuram, Chairman of the Parliamentary Standing Committee on External Affairs; Mr Swapan Dasgupta, Senior Indian Journalist and M P (RajyaSabha); Mr Anil Padmanabhan, Executive Editor at the Mint, Mr Douglas Busvine, New Delhi Bureau Chief at Thomson Reuters and Mr. Pranjal Sharma - Commentator, analyst, advisor on economy, globalisation and media. Mr Andrew Soper, Minister Counsellor (Political and Press), British High Commission moderated the session. EBG Federation – Bengaluru Chapter released the Position paper on key policy reforms for business growth on Friday, 8th July, 2016 in Bengaluru. The paper was released by the Chief Guest of Honour, Karnataka Industry Minister Mr. R V Deshpande, Chairperson, EBG Federation India - Mr. Raman Sidhu, Chairperson, EBG Federation Karnataka - Ms. Anandi Iyer & Senior Advisor, Position Paper & Sector Committee Chairperson - Mr. Rajeev Gupta. While addressing the participants at the release of the EBG Position paper, Mr. Deshpande said “Karnataka shares very strong alliance with all the European companies that have established here since past many years, there are several factors that have attracted the investors and big companies. However, I would also like to plea you to also look at expanding to places like Mysuru, Belagavi, Kalaburagi, Yadgir and Hubballi-Dharwad in Karnataka which are equally attractive in terms of connectivity, weather conditions & infrastructure with an added advantage for low cost lands. Much importance is also being given to improve infrastructure in Bengaluru too and we plan to set up elevated corridors and provide Metro connectivity to the airport”. The event was attended by luminaries, policy makers, decision makers, industry pioneers of European Companies including the General Consulates from British, German & Swiss. Commenting on the release of the position paper, Mr. Raman Sidhu – Chairman, EBG Federation India said “The EBG Federation is growing steadily, and thanks to the great contribution by the European companies and their representatives. Top CEO’s of the companies help us put together valuable recommendations and suggestions to improve the trade and economic relations between India & EU, which is a key USP for us.” Speaking on the occasion Ms. Anandi Iyer- Chairperson, EBG Federation- Bengaluru commented – “The EBG Federation in Karnataka is a vibrant and active community. We assure our full support to the Give of Karnataka in fostering our mutual ties”. The EBG Position Paper was presented to Shri Subhash Desai, the Minister for Industries & Mining, Government of Maharashtra on Wednesday, 4th May, 2016 at an evening event organised at The TajMahal Palace, Mumbai. It was a well-attended event. The event was supported by Fuchs Lubricants, Motul and Solvay Specialities Pvt. Ltd.
A panel discussion was organised jointly by Michelin India-EBG-IRF on “Responsible Road Behaviour”. Mr. Jean Todt, President FIA and UN Ambassador on Road Safety was the Chief Guest. The event was organised on Wednesday, 20th April 2016 at Imperial Hotel, Janpath Lane in New Delhi. The eminent panel included Mr Jean Todt, President, FIA, Ms.Deepa Menon, Senior Vice President, Corporate Communications & CSR, PVR Ltd and a senior official from the Government of India which covered topics on: Road Safety in India – Priorities and the Road’ Change agents and Brand Ambassadors Media as a tool for promoting Road Safety Behaviour Change Mr K KKapila, Chairman, International Road Federation (IRF) Geneva Programme Center moderated the session brilliantly. The 2016 edition of the EBG Position Paper was released by Shri Manoj Sinha, currently Minister of State for Communications (Independent charge) ; H.E Mr. Tomasz Kozlowski, Ambassador of the European Union to India; Shri Amitabh Kant, CEO, NitiAayog, and the present EU Memberstate Ambassadors on 19th April, 2016 at TajMahal Hotel, New Delhi. The event was well attended with around 200 participants and had representation from CEOs, CFOs and Managing Directors of major European companies, leading consultants and EU Member State Embassies. Ambassadors and senior officials from the EU Member States attended the event. It is noteworthy to mention about the efforts put in by all the Sector Committee Chairpersons & its members and all their knowledge partners for the timely publication of the EBG Position Paper, 2016 The event was sponsored by BMW, G4S, Maersk Group, YES Bank, BAE Systems, Bio Merieux, Hindustan Unilever Limited, SAAB Group, Michelin, Nokia, Outokumpu, Alar, Moet Hennessy &Kyndal Group. Union Budget Analysis Meeting on 4th March, 2016: EBG Bengaluru Chapter provided an opportunity for the members to get to know the insights of the Union Budget-2016 in association with BMR Advisors. This meeting brought key expectations on the direct tax and Indirect tax across IT &ITeS, Energy, Infrastructure & Manufacturing, Real Estate and Financial Services sectors. EBG members were invited to get expert insights and discuss in detail the significant announcements made in the budget, with experts at BMR Advisors, as the government presented its full-fledged budget on 29th February, 2016. The event was organized on Wednesday, 2nd March, 2016 at the Venetian, Royal Plaza, 19, Ashoka Road, New Delhi; within 2 days of the announcement of the budget. The event started at 10:30 AM and was followed by lunch. The speakers for the session were – Mr. Sumeet Hemkar, Partner, BMR & Associates LLP and Ms. Jayashree Parthasarathy, Partner, BMR & Associates LLP. Overview of the 2016 Budget was given by Mr. Hemkar and he also spoke on Direct Tax Aspects. Ms.Parthasarathy gave an insight on Indirect Tax Aspects. EBG Federation in association with the Indo French Chamber of Commerce in India (IFFCI) organized a Pre-Budget panel discussion with an eminent panel of journalists on Thursday, 18th February, 2016 at the French Embassy in New Delhi. The eminent panel included Dr SanjayaBaru, Director - Geo-Economics and Strategy, London and Honorary Senior Fellow, Centre for Policy Research, International Institute for Strategic Studies; Mr Anil Padmanabhan, Deputy Managing Editor, The Mint; Mr Ashok Malik, Senior fellow at the Observer Research Foundation and Dr Arvind Gupta, National Technology Head , BJP. The session was moderated by Mr Rajeev Gupta, Senior Advisor, EBG Sector Committees. It was a well-attended session where the participants got to hear the views of the panellists on the Union Budget 2016-17. The session was followed by a networking reception. The Pre-Budget session was supported by Market Insight, PernodRicard and Trilegal. Mumbai Chapter organized its ‘Welcome 2016 party’ on Sunday, 31st January, 2016 at CcazaCcomodore in Mandwa. The members enjoyed a relaxed day along with their families by the pool. Members travelled to Mandwa by a Catamaran. EBG had an excellent start to the year 2016 with a charismatic speaker, Mr Deepak Parekh, Chairman, HDFC Limited addressing the EBG members. The meeting was organised on Wednesday, 13th January, 2016 at Long Champ, TajMahal Hotel, New Delhi. It was very well attended. Mr Parekh spoke on “Investment lessons for foreign investors in India”. His address was very informative & crisp and supported by facts and figures. Great interest of audience clearly manifest in the never ending questions from them when the meeting had to be brought to a close. Mr Parekh is undoubtedly a man with a mission and a guiding force. Dr. Subir Gokarn shared his thoughts on "India as the destination for foreign investment"
EBG's signature event Delhi Diary - Topic: "Is Delhi/NCR safe for women?" The London Business School India Alumni Chapter invited EBG members to a panel discussion on "Can India become an Economic Superpower?" The eminent panel included of Dr.RaghuramRajan, Chief Economic Adviser to the Govt. of India; Mr. N. Chandrasekaran, CEO of TCS; Mr. Rana Kapoor, CEO of Yes Bank &Mr. Sunil Munjal, Hero Group. The discussions were moderated by Moderator: Mr.SenthilChengalvarayan, Group Editor, CNBC-TV18. The Session was attended by over 250 guests. EBG also had a good representation at the meeting. EBG members who participated included Mr. G S Ahuja, Mr. Rajeev Gupta ,Mr.BrijOberoi , Mr. J P Garg , Mr.Supratik Bhattacharya , Mr.VikasKuthiala, Mr.RanjitShastri, Mr Ravi Chaudhry, Mr. Francois Ravel, Mr.VenuYadavalli, Mr.ShavikeshGeol, Mr I P Singh, Mr. Rajiv Dhawan and Mr Raman Sidhu and many more. Mr. Peter Young is the EU Representative on the EBG Council. Mr. Young has completed his assignment in India. Mr. Young has been an ardent supporter of EBG. He always gave EBG an opportunity to meet the visiting senior officials from the European Commission. We got very high profile meetings for EBG with the visiting EU Commissioners to India. EBG's sector committees were valued highly by Mr. Young and he was always available for any guidance and advice on the sector committees. Dr Philippe de Taxis du Poët has been an integral part of EBG's ICT and Innovation Sector Committee. A survey report on "Innovation in India: Insight into European companies" was published by Bengaluru Chapter with his support. The farewell was also accorded to Mr. Peter Young and Dr Philippe de Taxis du Poët in presence of both our Mumbai and Bengaluru Chapter Chairpersons Mr KersiHilloo and Ms AnandiIyer and EBG India Chairman Mr Raman Sidhu . The 2nd EBG Leadership Series 2013: 2nd Workshop on "Leading JV's & PPPs in India: Practical Wisdom for All"